The goal of any research assessment is to evaluate the value or quality of the research in comparison to other research. As quality is highly subjective and difficult to measure, citations are used as a proxy. Citations are an important part of scholarly communication and a significant component of research evaluation, with the assumption being that highly cited work has influenced the work of many other researchers and hence it is more valuable. Recently we have seen new online data sources being researched for this purpose and disruptive ideas with the power to change research assessment, and perhaps even science as a whole, have been born. Altmetrics is the new research area that investigates the potential of these new data source as indicators of the impact that research has made on the scientific community and beyond, and thus possibly also as indicators of the societal impact of research. 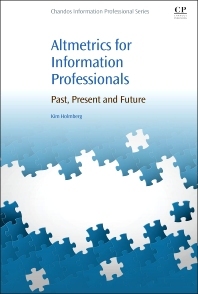 This book will present some of these new data sources, findings from earlier altmetrics research, and the disruptive ideas that may radically change scholarly communication. 8.5 How do researchers use the web for scholarly communication? Kim Holmberg is a research associate at the Research Unit for the Sociology of Education at the University of Turku, Finland, where he works on questions related to bibliometrics, altmetrics, open science and social media. He is also an Honorary Research Fellow at the Statistical Cybermetrics Research Group at the University of Wolverhampton, UK, and an Adjunct Professor at Åbo Akademi University, Finland. His academic background includes periods as a postdoc researcher at the University of Wolverhampton, UK, and at the VU University Amsterdam, The Netherlands. He has worked on topics such as hyperlink networks, climate change communications in social media, disciplinary differences in online scholarly communication, and educational use of virtual environments. Recently his research has focused on investigating the meaning and validity of altmetrics.